FRANKFORT, KY--(Marketwire - August 6, 2008) - Steve Schneider, CEO for ZAP (OTCBB: ZAAP) and Ashraf Saeed, COO of the Al Yousuf Group, stood by while Governor Steve Beshear yesterday signed an Executive Order directing the Transportation Cabinet to immediately develop and implement an emergency regulation authorizing the use of low-speed electric vehicles on Kentucky's roadways, including the Xebra, a 40 MPH electric car and truck. "Kentuckians, like all Americans, are hard hit by record-high gas prices," Gov. 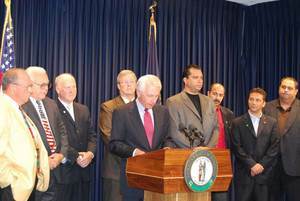 Beshear said at a news conference today announcing the order. "These tough times call for creative solutions, and I believe allowing Kentuckians the option of using an electric vehicle is one of those solutions. Electric vehicles may help ease the burden on the pocketbooks of hard-working Kentucky families, as well as reduce their carbon footprint." ZAP CEO Steve Schneider attended the press conference for the Governor's announcement as an invited guest by the State of Kentucky and officials with Integrity Manufacturing of Shepherdsville. Following the announcement Schneider and Governor Breshear got away from the press to talk and take a spin in a ZAP Xebra. Mr. Ashraf Saeed, Chief Operating Officer of the Al Yousuf Group, accompanied Schneider on the visit. A trading conglomerate based in Dubai, the Al Yousuf Group has provided nearly $15 million in capital over the past year to help ZAP increase its electric vehicle manufacturing, marketing and distribution. Schneider said both he and Saeed were very impressed by the visit and plan to explore ways of working with Kentucky to expand the use of electric vehicles. "Never have we received such hospitality and such overwhelming enthusiasm for electric vehicles as exhibited by the Governor and every single person we met while in Kentucky," said Schneider. "Seeing such a swift reaction by the Kentucky government in favor of ZAP affirms our belief that the time is now for electric transportation to play a greater role in society. We all want to build better transportation and it doesn't matter if you live in Kentucky or California, the dream is everywhere." ZAP has been a leader in advanced transportation technologies since 1994, delivering over 100,000 vehicles to consumers in more than 75 countries. ZAP is positioning its business at the forefront of fuel-efficient transportation with new technologies including energy efficient gas systems, electric, hybrid and other innovative power systems. ZAP currently manufactures the Xebra, a city-speed electric car and truck manufactured through a joint venture between ZAP and a Chinese automaker. ZAP has a joint venture called Detroit Electric to manufacture electric and hybrid vehicles with Youngman Automotive Group. Detroit Electric is developing a freeway capable electric vehicle called the ZAP Alias. Future plans for the venture are dependent upon both parties receiving outside financing. ZAP is also developing a new generation of vehicles using lithium batteries. The Company recently announced a strategic partnership with Dubai-based Al Yousuf Group to expand its international vehicle distribution. ZAP also makes an innovative, new portable energy technology that manages power for mobile electronics from cell phones to laptops. For product, dealer and investor information, visit http://www.zapworld.com. This press release contains forward-looking statements. Investors are cautioned that such forward-looking statements involve risks and uncertainties, including, without limitation, continued acceptance of the Company's products, increased levels of competition for the Company, new products and technological changes, the Company's dependence upon third-party suppliers, intellectual property rights, and other risks.